Pelle Gudmundsen-Holmgreen (b. 1932), one of the most important composers in Scandinavia, is both famous and notorious for simple, contrastful music that often borders on both the entertaining and the absurd. The contrastful and simple are also evident in the first recordings of the two works on this release: the piano concerto Plateaux pour Piano et Orchestre followed by Holmgreen's most expansive solo piano piece For Piano. The pianist in both works is the young Finn, Juho Pohjonen. The piano concerto is with the Danish National Symphony Orchestra and the Dutch conductor 2238 Ed Spanjaard. "...vivid performances from the Danish National SO in Plateaux. Cracking sound, too." "This is one of the most compelling new piano concertos in recent memory." I Brut 1:13 6,40 kr. II Simple. Prêsque rien 2:31 6,40 kr. III Murmure 4:57 6,40 kr. IV Brut 0:44 6,40 kr. V Brut 6:52 9,60 kr. VI Sombre. Simple 3:10 6,40 kr. VII Murmure dans la boue 3:57 6,40 kr. VIII Composition 10:43 12,80 kr. IX En majeur 3:49 6,40 kr. I Sound and Silence 10:35 12,80 kr. II Lullaby 4:25 6,40 kr. III Keep Going (Little Bird, Blue) 6:51 9,60 kr. Pelle Gudmundsen-Holmgreen is among the leading Scandinavian composers of the past half-century, a unique voice from the generation born in the inter-war years. In his early works Gudmundsen-Holmgreen's music took its point of departure in heroes like Bartók and Stravinsky. Around 1960 a phase began where he was influenced by post-war seria-lism. He rejected this path a few years later and instead became a pace-setter in ‘the New Simplicity', as it was called in Denmark: laconic, simplified music which in Gudmundsen-Holmgreen's hands can be provocatively absurd. Often a marked, black-humoured pessimism rears its head under the influence of the Irish writer Samuel Beckett. Childlike wonder meets cynical comment, cliché meets originality, the ecstatic is combined with the ascetic - Pelle Gudmundsen-Holmgreen's music is full of such clashes. Never fusty, always adamant. "Plateaux pour piano et orchestre builds on a limited and sometimes quite simple body of mate-rial. The solo voice too is to a great extent pared-down/bare. There has only been room for a few of the piano's diverse sonorities - but on these I insist! On the nine plateaux there are a few musical ‘objects' of quite different characters. Some of these ‘things' reap-pear on new plateaux in new contexts." Writing a large work in nine movements is unusual for Gudmundsen-Holmgreen. His Cello Concerto, Violin Concerto and Concerto Grosso are all long works in one uninterrupted pro-gres-sion. Plateaux pour piano et orchestre, on the other hand, is composed of what the composer calls "nine small peeps through a keyhole". The nine movements are of very different durations and character. The longest one lasts almost ten minutes, the shortest 35 seconds. "There isn't as much on every shelf, but each shelf has its own character and content," explains Pelle Gudmundsen-Holmgreen. "The point is to insist on what is there." This produces music with intense contrasts, where "Raw" is set against "Almost nothing" and "Simple" against "Murmuring in the mud". Everywhere the large is confronted with the small. In the sixth movement dark, equivocal chords in the low strings are set against a piano melody that a child could play. In the eighth movement this little melody has been moved up to another shelf and is now played on a flute, while the pulse that was played before in the left hand of the piano is played by the trombones. Here the piano joins forces with the harp and contributes cliché-like figures while the trumpets play a number of chords that appeared for the first time in the third movement. This sophisticated juxtaposition of ‘things' has the modernistically sober - and self-ironic? - title Composition. In the last movement Mozart pops up in the form of a quotation from his Piano Concerto no. 26, the "Coronation Concerto". Pelle Gudmundsen-Holmgreen says that he warmed up for the work with Plateaux pour piano et orchestre by listening to piano concertos by Ravel, Bartók, Stravinsky and not least Mozart. In the slow movement of the Coronation Concerto the childlike subject circles around gracefully and that is surely also what it does in Pelle Gudmundsen-Holm-green's work, although the motif has been slightly damaged by the shift to the unfamiliar surroundings. The various ‘things' in the music on the whole preserve their own nature - it is the juxtaposition of the plateaux that colours everything in new ways. 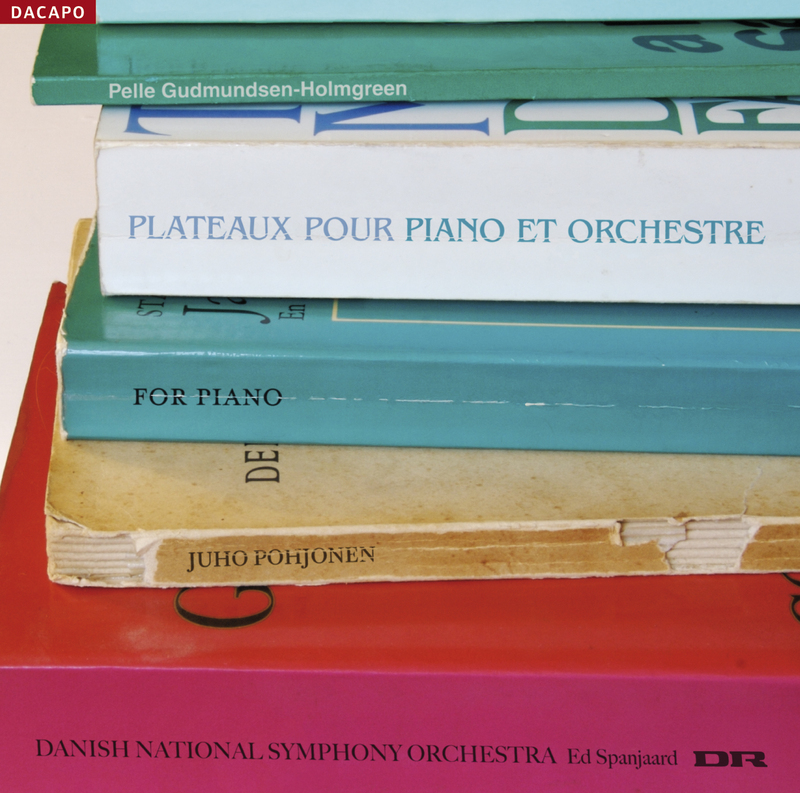 For Piano was written in 1992 and is Pelle Gudmundsen-Holmgreen's most expansive work for solo piano. It consists of three pieces that form a cyclic totality, although according to the com-poser they can also be performed individually. The musical totality is due to among other things the constraints Gudmundsen-Holm-green imposes on the tonal material. This is a principle he has used in most of his compositions since the beginning of the 1970s. The deselection of certain notes fills the remaining selection with holes like a grid - thus his name for the technique, the "tonal grid". Over the tonal grid Pelle -Gudmundsen-Holmgreen lays a rhythmic grid that allows each part to remain on its own rhythmic plateau. Within this delimited space the music can however be formed into more or less anything. There are in other words resemblances to Schoenberg's twelve-tone technique, but Gudmundsen-Holmgreen's grids give the music a clearer backbone and at the same time create the potential for striking confrontations. For Piano begins with a long, complex movement - like life itself, full of contrasts and clashes. The movement title Sound and Silence describes how the course of the music is to a great extent defined by the breaks between the constant re-uses of quite simple material. "What interests me is combining the most diverse musical ideas, forcing them together, shutting them in and pushing them into a musical ritual," Pelle -Gudmundsen-Holmgreen has explained. If Sound and Silence, with its composite, dynamic format, has the character of a typical ‘first movement', the subsequent movements pull the work in an unexpected direc-t---ion. Lullaby is one long descent into sleep where the right hand, like a rocking chair, tilts back and forth between G minor and E flat major. In the meantime the left hand - in a quite different tempo from the accompaniment - plays a quiet melody that emerges first in the middle of Sound and Silence. The rhythmic grid forms Lullaby into two periods of 35 bars where the second period slows down and in the end stops altogether. As the finishing flourish Gudmundsen-Holmgreen places a chord of the seventh, in just the same way as Schumann ends his piano piece Kind im Einschlummern in the famous collect-ion Kinderszenen. The third piece, Keep Going (Little Bird, Blue), takes up the musical material from the dynamic Sound and Silence again. The slumber is interrupted and the sleep is rubbed from the eyes. Before long the left hand never-theless starts the chair rocking again, back and forth in an arche-typally banal chord sequence (and yet - as everywhere in the work - in a 100% symmetrical structure). Over this rocking an improvised-sounding birdsong begins to grow up in the right hand. Keep Going (Little Bird, Blue) falls into three periods of 35 bars. To avoid caging the carefree little creature in stifling bonds the birdsong is allowed to continue alone, after the accompaniment in the left hand has gradually stopped completely. The three movement titles in For Piano may point to very simple phenomena, but as Pelle Gud-mund-sen-Holmgreen says, it amuses him "to discover when the banal can be-come something new and beautiful - yet again." Pelle Gudmundsen-Holmgreen zählt zu den führenden nordischen Komponisten des letzten halben Jahrhunderts; er ist eine einzigartige Stimme der zwischen den Weltkriegen geborenen Generation. In seinen Frühwerken orientierte sich Gudmundsen-Holmgreen an Helden wie Bartók und Strawinsky. Um 1960 begann dann eine vom Serialismus der Nachkriegszeit beeinflusste Phase. Diesen Weg verließ er jedoch wenige Jahre später und übernahm stattdessen eine tonangebende Rolle im Rahmen der „neuen Einfachheit", wie sie in Dänemark hieß, einer lakonischen und vereinfachten Musik, die unter Gudmundsen-Holmgreens Händen provozierend absurd sein kann. Oft zeichnet sich dabei unter dem Einfluss des irischen Dichters Samuel Beckett ein markanter schwarzer Galgenhumor ab. Kindliches Staunen trifft auf zynische Kommentare, Klischees prallen auf Originalität, Ekstase vereint sich mit Askese. Diese Art Zusammenprall findet man in Gudmundsen-Holmgreens Musik häufig. Nie bemoost, oft unterhaltsam, immer eigenwillig. „Plateaux pour piano et orchestre baut auf begrenztem und zuweilen ganz einfachem Material auf. Auch die Solostimme ist zum großen Teil gestrippt/nackt. Hier ist nur Raum für ganz venige der vielfältigen klanglichen Möglichkeiten des Klaviers, die dafür allerdings auch festgehalten werden! Auf den neun Plateaus findet man einige wenige musikalische „Objekte" ganz unterschiedlicher Art. Einige dieser „Dinge" tauchen in neuen Zusammenhängen auf neuen Plateaus wieder auf." Ein großes Werk in neun Sätzen ist für Gudmundsen-Holmgreen ungewöhnlich. Sowohl sein Cellokonzert wie sein Violinkonzert und sein Concerto Grosso sind lange, nicht durch Zäsuren unterbrochene Werke. Plateaux pour piano et orchestre setzt sich mit den Worten des Komponisten dagegen aus „neun kleinen Blicken durch ein Schlüsselloch" zusammen. Die neun Sätze sind ganz unterschiedlich lang und von unterschiedlicher Art. Der längste dauert fast zehn Minuten, der kürzeste nur 35 Sekunden. „Auf dem einzelnen Regal liegt nicht so viel, aber jedes hat seinen eigenen Charakter und seinen eigenen Inhalt", erläutert Gudmundsen-Holmgreen. „Es kommt eben gerade darauf an festzuhalten, was da ist." Das ergibt Musik mit heftigen Gegensätzen, wo „Roh" mit „Fast nichts" und „Einfach" mit „Murren im Modder" konfrontiert wird. Überall steht das Große dem Kleinen gegenüber. Im sechsten Satz spürt man Dunkelheit und unklare Akkorde der tiefen Streicher gegenüber einer Klaviermelodie, die ein Kind spielen könnte. Im achten Satz ist diese kleine Melodie verlagert und wird jetzt von einer Flöte gespielt, während der bisher in der linken Klavierhand angesiedelte Puls von den Posaunen gespielt wird. Das Klavier tut sich hier mit der Harfe zusammen und steuert klischeehafte Figurationen bei, während die Trompeten eine Reihe von Akkorden spielen, die erstmals im dritten Satz vorkommen. Diese raffinierte Zusammensetzung von „Dingen" trägt den modernistisch nüchternen - und selbstironischen? - Titel Komposition. Im letzten Satz taucht Mozart mit einem Zitat aus seinem Klavierkonzert Nr. 26, dem Krönungskonzert, auf. Gudmundsen-Holmgreen berichtet, er habe sich für die Arbeit an Plateaux pour piano et orchestre mit Klavier-konzerten von Ravel, Bartók, Strawinsky und nicht zuletzt Mozart aufgewärmt. Im langsamen Satz des Krönungskonzerts kreist das kindliche Motiv graziös, was wohl eigentlich auch bei Gudmundsen-Holmgreen der Fall ist, auch wenn das Motiv durch die Verlegung in das ungewohnte Umfeld etwas ramponiert erscheint. Die verschiedenen „Dinge" der Musik erhalten sich überhaupt ihr Wesen, ihre neue Färbung bekommen sie durch die Zusammensetzung der Plateaus. For Piano wurde 1992 geschrieben und ist Gudmundsen-Holmgreens umfassendstes Werk für Soloklavier. Es besteht aus drei, ein zyklisches Ganzes bildenden Stücken, obwohl sie sich nach Aussage des Komponisten auch einzeln aufführen lassen. Die musikalische Ganzheit beruht u. a. auf der von Gudmundsen-Holmgreen vorgenommenen Begrenzung des Tonmaterials. Dieses Prinzip benutzt er seit Beginn der 1970er Jahre in den meisten seiner Kompositionen. Einzelne Töne werden herausgestochen, wodurch die übrige Auswahl wie ein Gitter durchlöchert wird, weshalb er diese Technik auch als „Tongitter" bezeichnet. Über das Tongitter legt Gudmundsen-Holmgreen ein rhythmisches Gitter, das jede Stimme auf ihrer eigenen rhythmischen Ebene verweilen lässt. Innerhalb dieses abgegrenzten Raums kann sich die Musik dafür im Großen und Ganzen nach Belieben formen. Hier zeigen sich also Ähnlichkeiten mit Schönbergs Zwölftontechnik, wobei Gudmundsen-Holmgreens Gitter der Musik jedoch ein deutlicheres Rückgrat verleihen und zugleich die Möglichkeit markanter Konfrontationen verstärken. For Piano beginnt mit einem langen und komplexen Satz. Wie das Leben selbst voll von Kontrasten und Zusammenstößen. Der Satztitel Sound and Silence verdeutlicht, dass der Ablauf in hohem Maß von den Pausen zwischen der ständigen Verwendung des recht einfachen Materials definiert wird. „Mich interessiert es, die unterschiedlichsten musikalischen Ideen zu kombinieren, sie zusammenzuzwingen, sie einzusperren und sie in ein musikalisches Ritual hineinzuschieben", hat Gudmundsen-Holmgreen erklärt. Wenn Sound and Silence in seinem komplizierten und dynamischen Format den Charakter eines typischen „ersten Satzes" hat, so ziehen die nachfolgenden Sätze das Werk in eine unerwartete Richtung. Lullaby ist ein einziges langes Einschlummern, bei dem die rechte Hand wie ein wiegender Schaukelstuhl zwischen g-Moll und Es-Dur wippt. Inzwischen spielt die linke Hand, in völlig anderem Tempo als die Begleitung, eine unauffällige Melodie, die erstmals in der Mitte von Sound and Silence auftauchte. Das Rhythmusgitter formt Lullaby in zwei Perioden von 35 Takten, wobei die zweite langsamer geht und zuletzt völlig stehen bleibt. Als I-Tüpfelchen setzt Gudmundsen-Holmgreen einen Septakkord, so wie Schumann in seiner berühmten Sammlung Kinderszenen sein Klavierstück Kind im Einschlummern beschließt. Das dritte Stück, Keep Going (Little Bird, Blue) greift das musikalische Material des dynamischen Sound and Silence wieder auf. Der Schlummer wird unterbrochen, man reibt sich den Schlaf aus den Augen. Schon bald aber beginnt die linke Hand trotzdem ein neues Schaukelstuhlwiegen, hin und her in einem grundbanalen Akkordzusammenhang (jedoch, wie überall in dem Werk, in hundertprozentig symmetrischer Struktur). Über diesem Wiegen entwächst der rechten Hand allmählich ein fast improvisierter Vogelgesang. Keep Going (Little Bird, Blue) gliedert sich in drei Perioden von 35 Takten. Um das kleine, sorglose Naturwesen nicht in lästige Fesseln zu legen, darf die Vogelstimme allein weitermachen, nachdem die Begleitung der linken Hand allmählich völlig aufgehört hat. Die drei Satztitel von For Piano verweisen möglicherweise auf sehr einfache Phänomene, doch es macht dem Komponisten nach eigener Aussage „Spaß, zu entdecken, wie aus dem Banalen - noch einmal - etwas Neues und Schönes werden kann."